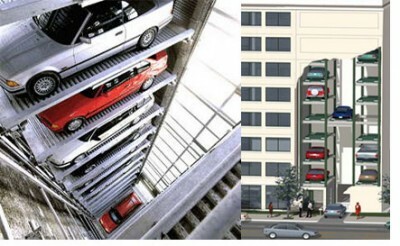 Say goodbye to parking garages, and hello to valet parking systems. SpaceSaver Parking Systems are letting urbanites have their cake and eat it too. The system automatically delivers your car right at the front of the building, like the moving rack at the dry cleaners does for your business attire. You can call ahead for your car from the elevator so it’ll be waiting for you. This CNN news clip best shows how it works. No more searching for lost cars in parking garages. No broken in or even stolen cars. No having to take valuables out of the car every time – even keys. No more scary late night walks in eerily uninhabited parking garages. No more having to go home early just because it’s getting too late to walk alone in the parking garage. Then again, half the people in Manhattan don’t even have driver’s licenses, and often wouldn’t live anywhere else.